Let's talk about something that's sure to make you hungry. 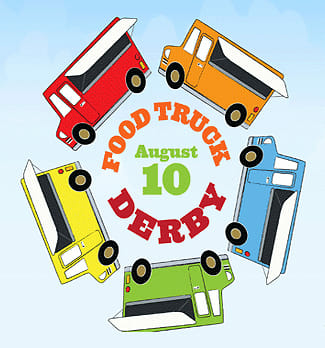 Like, go eat a snack before reading this, because this afternoon, August 10th, from 4-7 PM it seems we have a Food Truck Derby hitting the the Hayground School. The trucks will be bringing all sorts of gourmet treats from grilled cheese to hibachi, as well as donuts, cupcakes and much more. A great excuse to let go of your table manners and take a break from the usual Hamptons cuisine, this food fest is also a way to eat for a good cause. General admission will set you back $50, but will benefit both the Hayground School and Jeff's Kitchen, both of which will benefit local children. And that entrance fee will provide you one serving at each of the trucks stationed on the potato fields of the Hayground School. So which of your favorite food trucks will be there? Rickshaw Dumplings, Food Freaks, Morris Grilled Cheese, La Bella Torte, The Wandering Palate, Hibachi Heaven, Sweet 'Tauk, Hamptons Foodie, Rolling In the Dough, Silver Spoon Specialties and much more. Beer will be provided by Southampton Publick House, and Brooklyn Brewery, while the wine is coming from Wolffer Estate and Peconic Bay Winery. No alcohol for you? There will also be Zico Coconut Water, Sweet 'tauk tea and more to choose from. Go HERE to score some last minute tickets!